-Women like bling. Like, a lot. The medals for this race were upwards of a pound. Not kidding at all, and I think we know where the race fees went to. -There's a lot of pink. Yeah, big surprise there. Pink at a women's race. On the plus side, there are very few tiaras and boas, so I think it turned out better than I expected. -You'll feel faster than normal. My overall place for this race was 192/2,900. I think it's safe to say that if it was a race with equal numbers of men and women, you could add a good 1,000 places to my final placing. Have you ever run a women's only race? Do you want to? I don't think I would ever go out of my race to run in a women's only race at all, but it is a lot of fun. 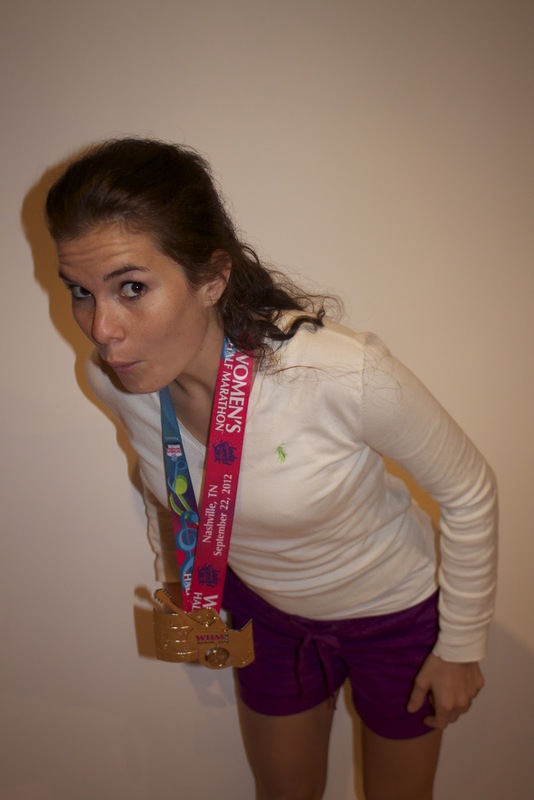 Would you rather have a giant medal or an awesome tech tee? Honestly, I like the medals after running a race. It's fun to see them all hung up, so I like that aspect. However, this giant one was so unnecessary. It was almost too big to wear, and it's nearly twice the size of my other medals! While we got a tech tee for this race, it was a little...cheap. I would have preferred an awesome hoodie or long sleeve tee instead. Holy crap that's the giantest medal ever. It might even be bigger than Disney medals. Goodness. I've never run a women's only race. I was registered for one about 2 hours away earlier this year, and super stoked to go run a PR. And then I showed up on Sunday, but oops, the race was Saturday. So. Yeah. I much prefer useful swag and awards at races (favorite: bamboo light jacket) myself. And I'm not really too keen on women's only races, mostly because I loathe pink. That is a pretty big medal all right! I haven't thought about a women's only race. I might like that. I'm with Gracie on this one. I'm generally not a fan of pink-ness. I have no beef with other people loving pink, I'm just more of a black-and-red kind of gal. But I have run an all-women 10k and my very first race ever EVER was a women-only triathlon. There were no men even pacing in that event! Both races gave me a goosbumpy/proud-of-my-gender feeling, especially at the starting line. (Think about how far we've come since Title IX forty years ago!!!) But I still prefer co-ed racing. Hey, I ran this one too! I wasn't sure how I would like it either, but I liked that it was a smaller race for the area. Everyone was so dang nice and positive, it was impossible not to enjoy it. I talked to several random women who were planning on walking that day, so I wonder what percentage of walkers this race had, like maybe because it is all women people feel more comfortable walking. And I wouldn't mind the shirts if they fit better and had a cooler design. But hoodies would be awesome!! Vanessa, congrats on your PR, you totally deserve it! Annnd you just made my day with your comment. Yes, it was me. I've been absolutely horrendous about keeping up with the blog world, so don't feel bad about just finding out. My life is going to hopefully settle down shortly and I'll get back to my proper stalking in due time. I think a nice hoodie would have been great! The medal is huge and heavy but I do like the charm idea. I probably won't do another women's race unless there's a group of us doing it together. It's funny because I'm a super girl-power, feminist, women-are-strong person, but I really don't 'get' women's only races. I guess because it's counter intuitive to me...if I'm all about women-are-strong-like-men, then why in the WORLD can't they run in a normal race with men? Just sayin. I'm with Becky. I get that women's races are probably good for beginners who are intimidated about running with men, or for women who want to wear tutus, but I JUST DON'T GET IT. There is clearly a market, but I'm not it. If it's about girl-power, then why wouldn't you want to race against men? Additionally, running with men is good for women. As you pointed out, most men are faster...so you can use them as motivation to run faster! And I want a tech tee all the way. Honestly, I used to throw away my medals b/c they were cluttering up stuff. My husband started running and made me stop that, so now we have a medal rack, which is nice. But still...the tech shirt is sooo much more practical! Yeah, those medals are just ridiculous. I like getting medals because I have mine hanging up and it's fun to look at, but I like good shirts more. I wish more races gave hoodies or long sleeve tees! I have a jazillion tee shirts and short sleeve tech tees….and I wear short sleeves to run in about once or twice a year so I don't even have much use for them! I'd run in a men's race. Then again, I'm also not afraid to say the word "testicle" so maybe I'd fit in more than you. I find all women's races a little condescending. It's like "Here's a pretty pink shirt because you LOVE pink and a sparkly necklace because women are like birds and can't resist SPARKLE!" I also never used the "women's only" area of my gym when that was an option. Sorry, but that's just a little too Saudi for me. Ya, I did the Irongirl triathlon, to be honest I didn't even know it was women only when I signed up, I just knew it was good for beginners. It seems like an excuse to charge more for the race fee. I like doing races with Eric and other male friends so there's really no appeal for me, plus I don't see the advantage. I've had women I work with go to women's only gyms and freak out when it was closed for renovations and they had to go to the co-ed one temporarily. I assume these are the same people who wear makeup to the gym and would never think of going to Target in sweatpants. The only exclusively women's event I do is a local 5k/10k that's about 5,000 women between the walkers and runners, held every October and 100% of the proceeds go to LOCAL breast cancer research, program, support, etc. It was a very important event to my stepmom who lost her mom to breast cancer and even more so now that she's a survivor. It does have that girl power-y feel to it, but it's as much about the effects of cancer and the struggle with that battle that keeps me coming back. A lot of the paraphernalia is pink, but last year's tee was turquoise and I actually get a lot of use out of it (no medals in a 5k, damn). Men are strictly prohibited from running this race at all, although they can volunteer. Love those photos of you and your medal, though! 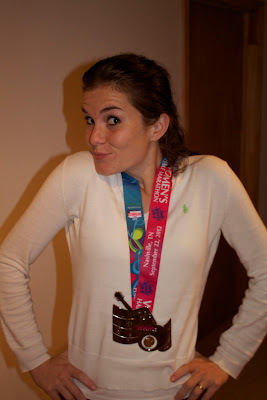 I'm really into the bling for the wearing-it-around-after-the-race factor. I have done one women's only race - it was a 5K and there wasn't a lot of pink. It was a race in honour of an elite runner who had been killed when she was hit by a car during a training run. So it was less "fluffy and pink" and a little more "we're women and we love running." It was a lot of fun. I've thought about doing a women's only race... I'd actually LOVE to do the Divas Half in Honolulu because... it's Hawaii, so duh. haha. That medal is just ridiculous! I like getting a medal but I'd be more excited about a quality tee or sweatshirt that I can wear on a daily basis. I'd totally run a men's race. You're still bound to beat a ton of people and that's really what I'm all about. My medal from the Hartford Marathon is SO heavy. I had vertigo after the race, so putting that thing around my neck and trying to walk around was a serious challenge. I have only done one women's race and it was just an 8k. It was lots of fun because I ran with my friend who was racing for the first time. It was kind of cool to just have women running but at the same time I don't necessarily prefer it. I like all races! And I definitely didn't get a medal like yours! Wow what a medal! I wouldn't go out of my way for a woman's only race. Maybe if it's your first one and you don't want to feel intimidated, I could see this being beneficial for a 1st triathlon. I'd rather have a shirt that fits well hopefully it was a women's cut at least! Good job! I ran the Nike Women's Marathon in San Francisco in 2009 and there were a bunch of normal men running it too. It made me sad, because that race caps off at like 20,000 and they get like 50,000 applicants, and here those men were taking a spot away from a women. The race I am running this weekend is women only, I have never run a women only race so I am really excited but you are right it would be weird to see a single man running with all women. i did ZOOMA atlanta 3 years ago-i enjoyed the race size and the girl power thing (like you-not really a big deal to me) but i prefer a medal. i don’t wear a lot of day-to-day jewelry adn even the tiffany’s necklace doesn’t entice me to do NWM. assuming you know the answer to the second question, definitely prefer a medal-would go completely against my blog if i didn’t, right?? That medal is MASSIVE!! I love getting medals after races but I honestly don't think I would like that huge thing on my medal hanger. I ran the "Starbucks Run for Women" in the Spring which was a race to raise money for the "Because I'm A Girl" foundation and there were a few guys running but they were with their daughters or spouses. And you got a lavender shirt so I doubt any of them will wear them. I was actually surprised at how much I loved this race and there was pink lemonade. I don't think it's legal to have a women's race without pink. Awesome Blog! I saw you followed me on twitter, and it looks like we have similar styles and interests. I've already got lost in a few entries here. Totally going to try and implement the DIY walking desk. My very first 5K was a women's only event. I did it with my sister, and it was a lot of fun! I'd definitely run one again. I'm much rather have a nice tech tee than a huge medal.